Barack Obama's victory over Mitt Romney could have significant implications for America's approach to countries ranging from China to Russia. But U.S. policy toward Africa was unlikely to shift dramatically no matter who was elected president this week — a remarkable fact considering that nearly every foreign policy issue is cannon fodder for partisan battles these days. Over the last two decades, successive administrations and congressional leaders have, for the most part, striven to ensure that U.S. policy toward Africa is formulated on a bipartisan basis. This is in part because astute policy leaders have concluded that political bickering could threaten the tenuous interest the African continent generates in most of official Washington. But Africa's well-publicized cases of famine, genocide, and civil conflict have also solidified an esprit de corps among a dedicated minority of elected officials — and their partners in think tanks, academic institutions, and non-governmental organizations — who have resolved to hang together on all things African in order to enhance policy effectiveness. Senators John Kerry (D-MA) and Richard Lugar (R-IN), for example, joined forces to support Obama's efforts to achieve a peaceful independence referendum for South Sudan. The bipartisan agenda is a largely positive one that seeks to build on Africa's emergence as a rapidly growing actor in the global economy, a major contributor to peacekeeping and peacemaking, a vibrant source of cultural innovation, and a hub of civil society change agents committed to shaping a better future for the continent. But that is the known world. It is in the realm of the unknown where presidential leadership and appointments to key Africa-related positions might make the biggest difference, and where the president will be able to demonstrate America's continuing importance on the African continent as Africa's relevance to U.S. interests becomes increasingly apparent. Here are some of the predictably unpredictable challenges that will likely greet Obama as he begins his second term. The next major front for international military action in support of counterterrorism objectives could very well be northern Mali, where a coalition of states will likely help a West African military force dislodge Islamist groups with ties to international terrorist, drug, and human trafficking networks. How that military force will be constituted and what role the United States will play remains unclear. The U.N. Security Council recently passed a resolution that paves the way for an intervention force and calls for an action plan to be drawn up before the end of November, and the United States will likely provide air power (possibly drones), intelligence, and logistical support to the effort. The conflict will probably be protracted and bloody, and made more problematic by the lack of a credible government to partner with in southern Mali. And the fighting has the potential to destabilize the entire Sahel, especially amid the fallout from the collapse of Muammar al-Qaddafi's regime in Libya. To complicate matters, Mali is not the only West African country where an Islamist threat exists. Boko Haram has so far focused on internal targets in Nigeria, and the United States will continue to support the Nigerian government's efforts to contain this rapidly expanding militant organization. But Washington could take more aggressive action — in the form, say, of more direct support for the Nigerian government's counterinsurgency efforts — if Boko Haram sets its sights on international targets and threatens U.S. companies in the region. In Somalia, recent successes in standing up a new government in Mogadishu and extending state administration throughout previously contested southern Somalia do not alter the fact that al-Shabab, the al Qaeda-affiliated Islamist militia, is still alive and dangerous, with a demonstrated track record of attacking local and international targets. Al-Shabab will probably continue to focus on soft targets not only within Somalia but also in Kenya, Uganda, and other countries that have contributed troops to the African Union mission that has — with strong U.S. support — helped the Somali government consolidate control over wide swathes of the country. Should al-Shabab increase its attacks on targets in neighboring countries, the United States could become more deeply enmeshed in regional counterterrorism operations from both the ground (commando raids) and the air (drone strikes). Conflicts in East and Central Africa, which have claimed millions of African lives and spilled over numerous African borders, will undoubtedly explode early on in Obama's second term. The intensifying civil war within Sudan (playing out against the backdrop of a shaky peace between Sudan and South Sudan) could blow up, as rebels in Darfur, Blue Nile, South Kordofan, and eastern Sudan all conspire to overthrow a despotic, corrupt regime that has ruled Sudan for nearly a quarter of a century under a head of state that is wanted for genocide by the International Criminal Court. The United States will need to keep a watchful eye on Khartoum's support for jihadist networks, especially in the aftermath of a possible Israeli bombing of a Khartoum munitions factory in October. In confronting the volatile dynamic within Sudan and between Sudan and South Sudan, the United States will have to juggle the competing policy demands of peacemaking, counterterrorism, democracy advocacy, and human rights promotion. Peacemaking and counterterrorism cooperation drove policy during Obama's first term. But if that cooperation diminishes, human rights and democracy promotion could take a front seat. As bloody as the conflict in Sudan is, it is no match in terms of sheer mortality for the ongoing cycle of destruction in eastern Congo, which has claimed more than five million lives since 1998 according to the International Rescue Committee. The Rwandan government is orchestrating the newest round of warfare, which was sparked by the M23 rebellion in April, with support from Uganda, according to a U.N. panel of experts and Human Rights Watch. If the international community fails to muster the will to counter this cross-border meddling, neighboring countries — particularly Rwanda and Uganda — will continue to intervene, lured in by the prospect of plundering Congo's natural resources. Numerous armed groups are taking advantage of a collapsed Congolese state, which has been deliberately kept that way by corrupt military and political leaders in the Democratic Republic of the Congo, who benefit from mineral smuggling and whose profits would be cratered if there were effective state institutions in Congo like a functioning military and justice system. As the death tolls mounts, pressure — led by U.S. students demanding phones and laptops that don't contain Congo's tainted minerals — will increase for more meaningful international action, which presently consists of a meandering peace process, a barely relevant peacekeeping mission, and a set of unimplemented U.S. regulations aimed at creating some transparency in the mining sector for the first time in history. Ultimately, a peace process must evolve that gets at the core interests — especially economic ones — of Congolese and regional actors, because sending more peacekeepers and cutting more short-term power-sharing deals are only stopgap measures that have proved utterly insufficient at bringing an end to the conflict. A third cross-border conflict has captured the imagination of young people all over the United States and around the world even though it is not nearly as deadly as the first two. 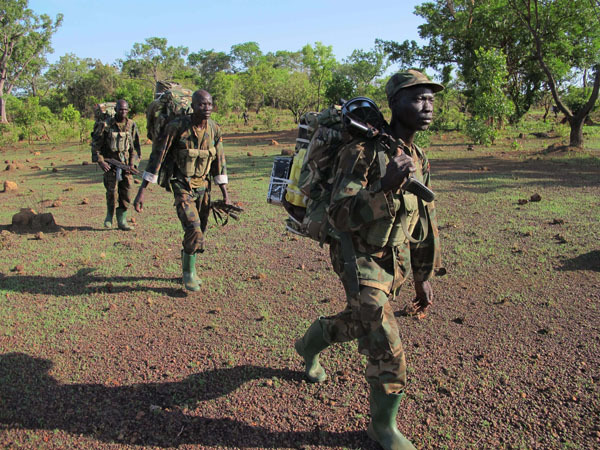 The Lord's Resistance Army (LRA), led by Joseph Kony, is now destabilizing pockets of civilian populations in Congo, South Sudan, and the Central African Republic (the group is also alleged to be in Darfur and threatens to return to northern Uganda). The United States has deployed 100 military advisors to support a primarily Ugandan effort to contain the LRA, but the endeavor — though admirable — still lacks a credible mechanism for removing Kony from the battlefield. Obama will eventually face a decision: Should the United States beef up the existing mission or bring the boys home and leave Kony in place to rebuild the LRA and continue his atrocities unchecked? Obama can help minimize or prevent future crises in the region with a vigorous and deeper investment in special envoy diplomacy, international justice mechanisms, trade and development partnerships, African institutional capacity building, multilateral cooperation on countering criminal and terrorist networks, and strategic support for democratic transformation. A U.S.-led multinational effort to build and support a credible peace process in Congo, for instance, could have a major impact on stability in the entire Central African region. Partnering with key African states on counterterrorism efforts and then using that leverage to support real democratic reforms and human rights protections could be game-changing. By working with the country's bipartisan coalition and African allies to expand the architecture of crisis prevention in the region, the president can play a major role in helping Africa reach its true potential.